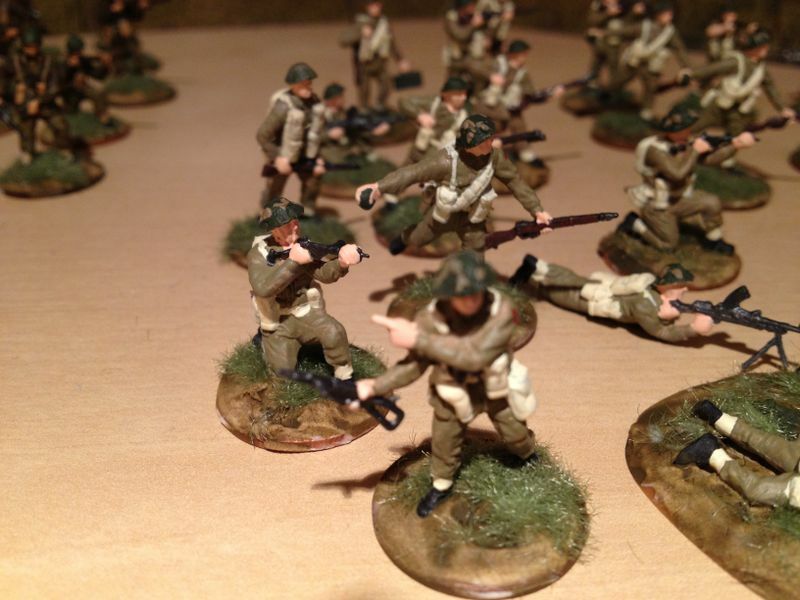 I am building up a British army to field in my Battlegroup Overlord games. 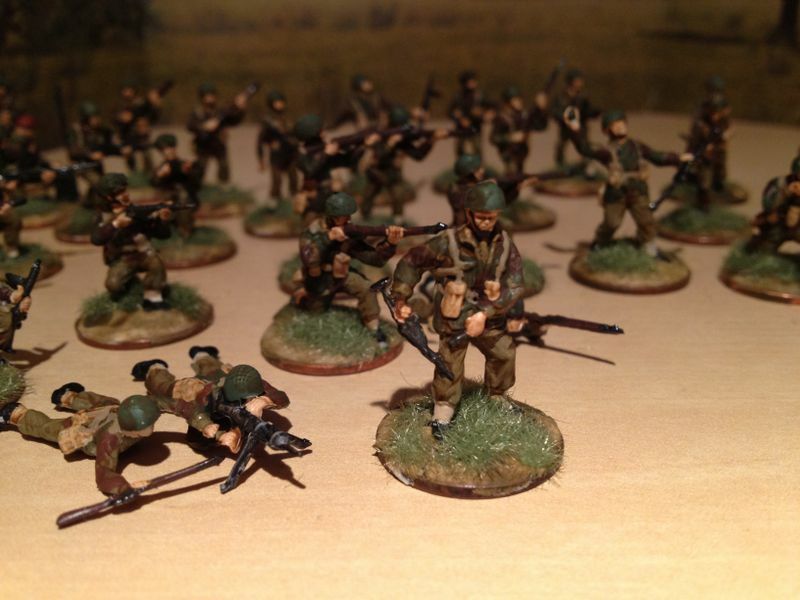 So far I have 75 airborne troops painted and an additional 35+ Infantry from Revell’s sets Late War British, and ANZAC. 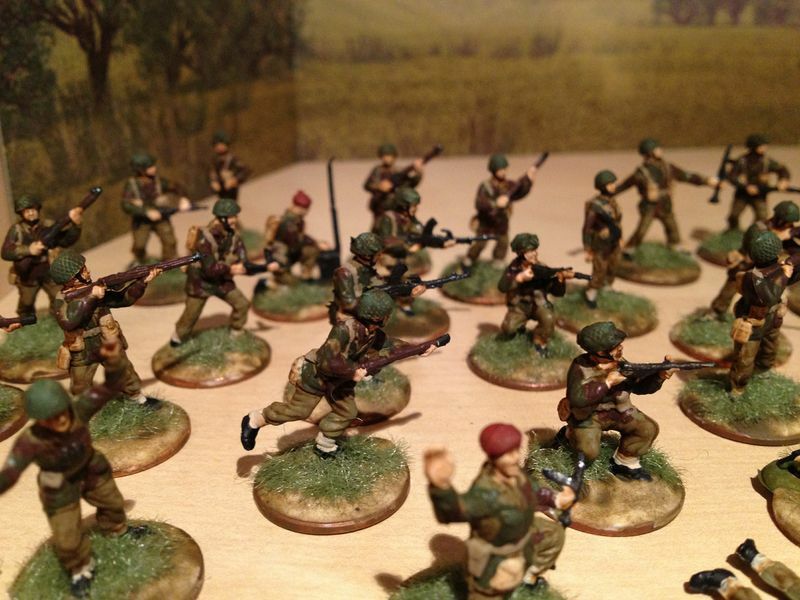 I will be supplementing in the future with Plastic Soldier Company’s outstanding Late War British Infantry Set as well as the Zvezda HMG (vickers I believe). 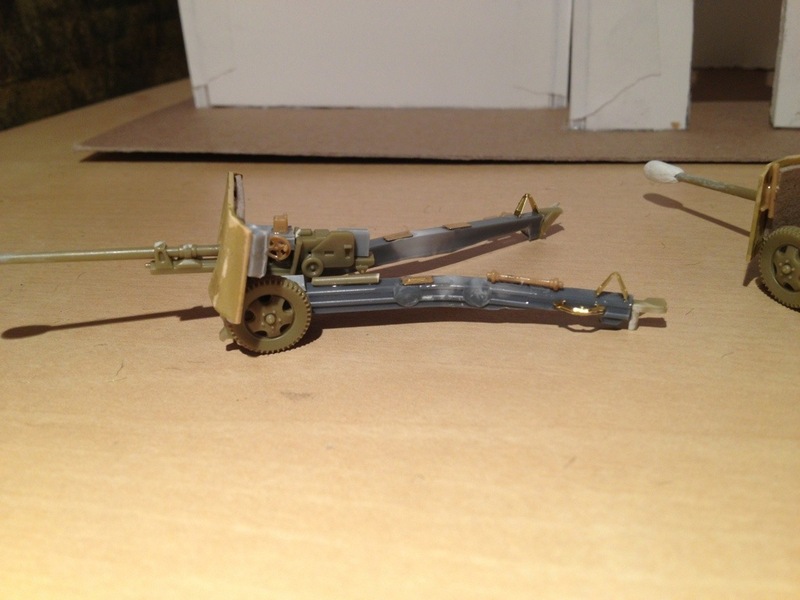 I also plan to add some Bren Gun Carriers from PSC, 4 Cromwell Tanks, and a pair of Achilles, along with some medium/heavy mortars from Hat, and tank riders to place into my M5 halftracks. I already have a pair of chruchills, 5 fireflies, shermans galore, and a comet to give the british their own flair. 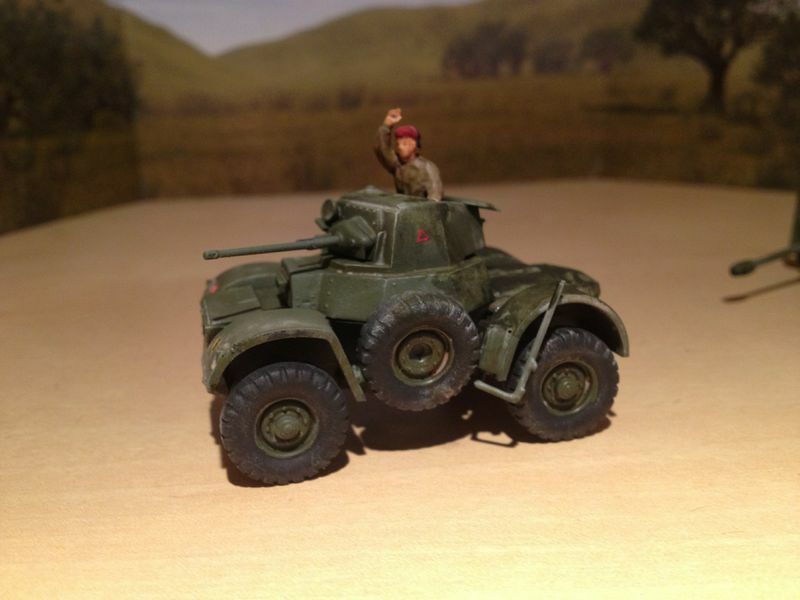 For Arty I made 2 17 pdrs, and have the old standby 1:76 Airfix 6Pdrs and 25Pdrs along with the bren carriers and Morris Quads. 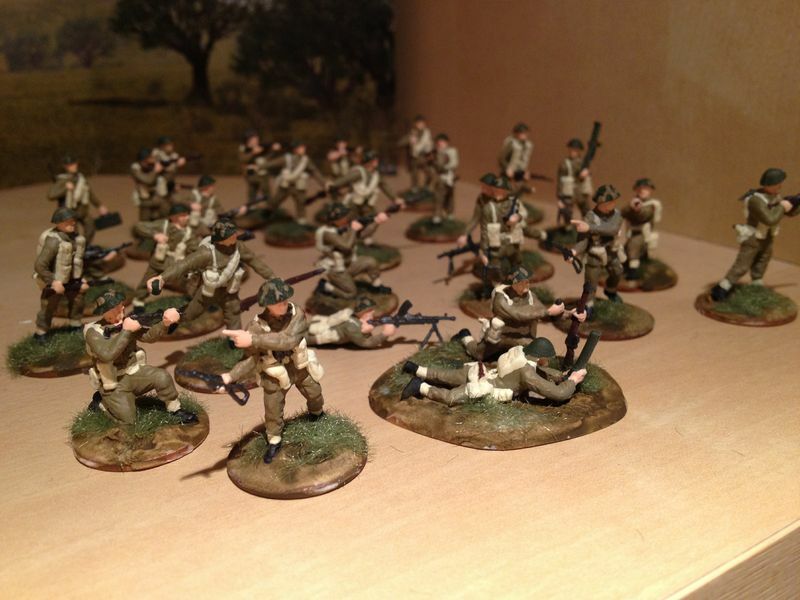 So far I think my British are looking pretty dandy if I must say. 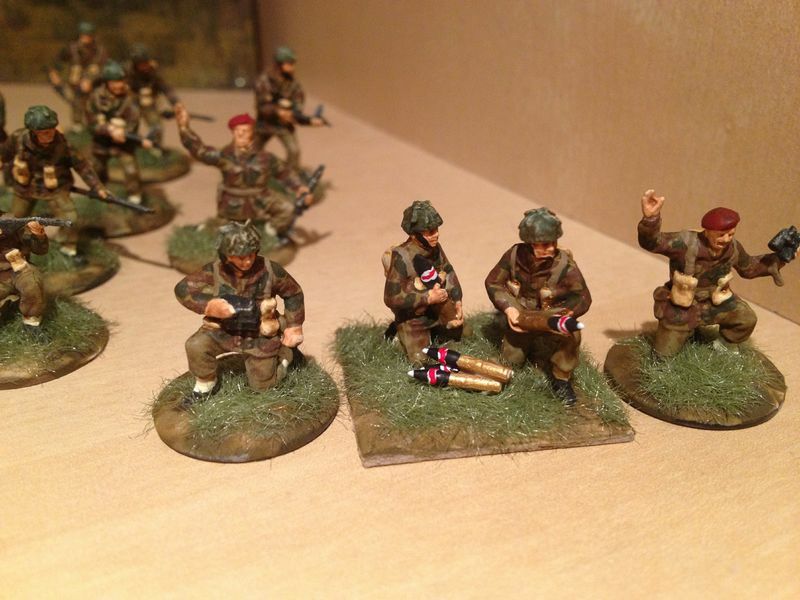 Here are some pics of the painted lads. I am thinking of giving them a wash to bring out some of the details. I just purchased two citadel washes (nuln oil (badab black), and Agrax Earthshade (used to be devlan mud)). If anyone has any kind advice on how i can make these troops pop, I am all ears. 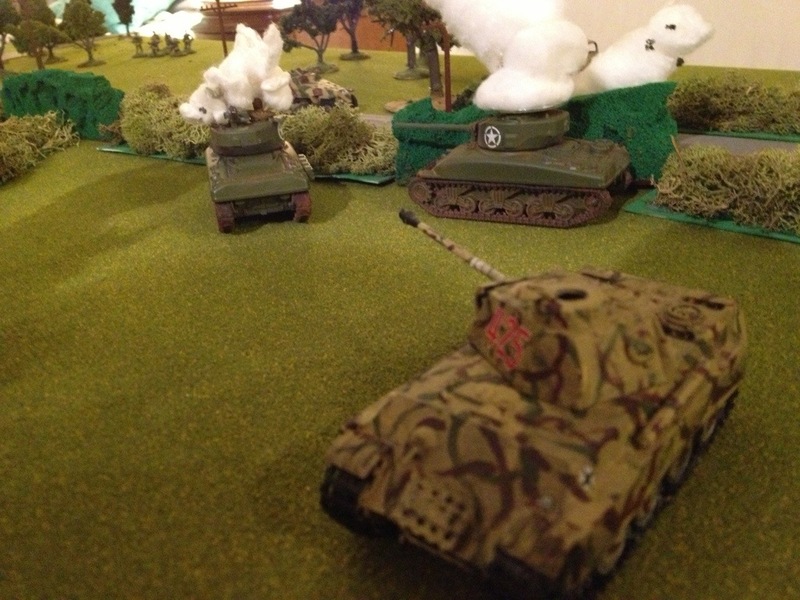 Below are my finished Daimler Mk II by Hasegawa, and an Italeri M20. 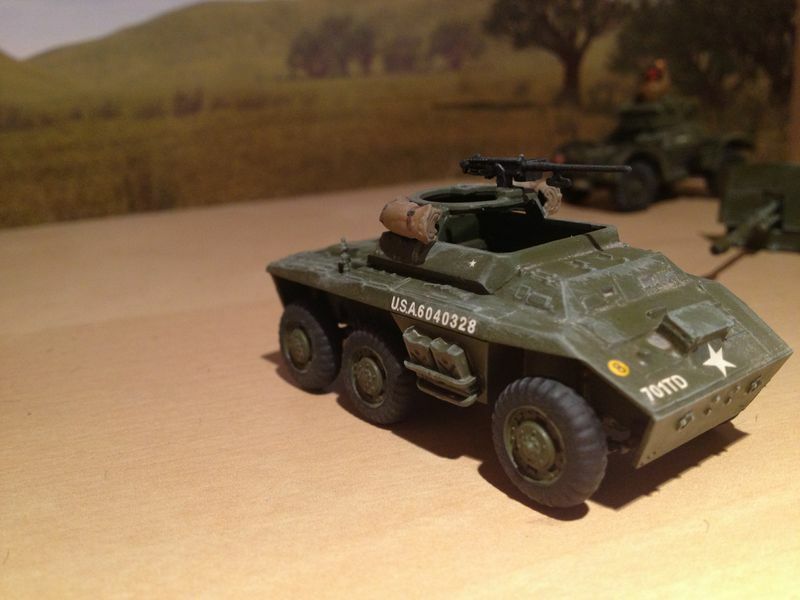 Both sets were fun and easy builds, and I am planning on getting the corresponding M8 greyhound set from Italeri, as well as a humber Mk II from Hasegawa. 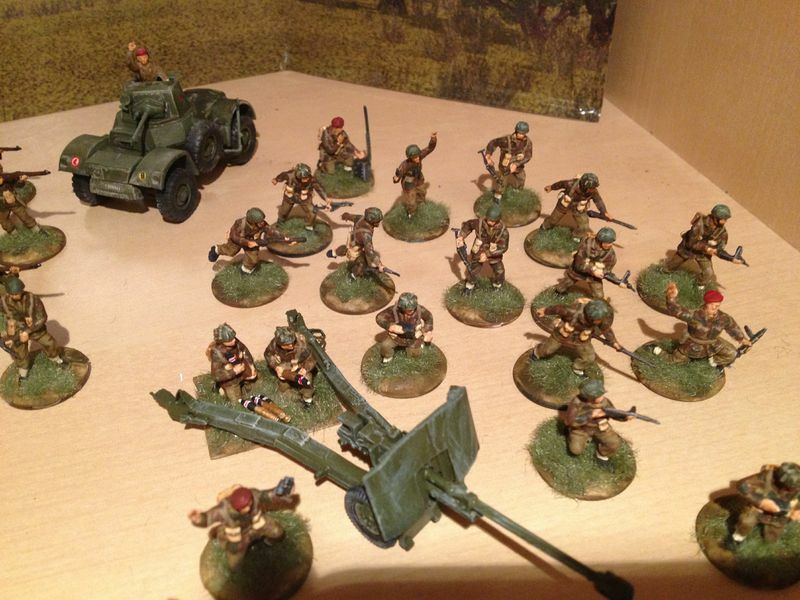 Both will be welcome additions to my growing needs for recce/coms units for the allies. 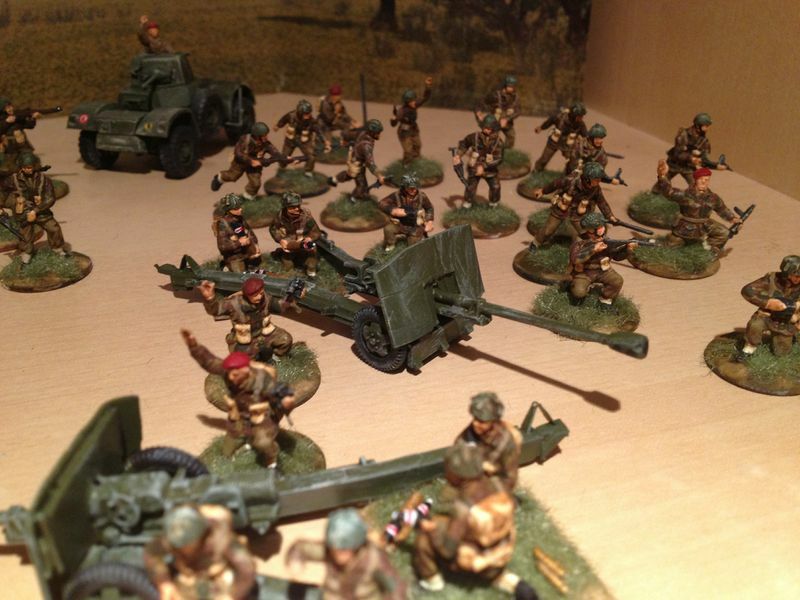 Below are shots of my newly painted 6th Airborne with scratch-built 17Pdrs. 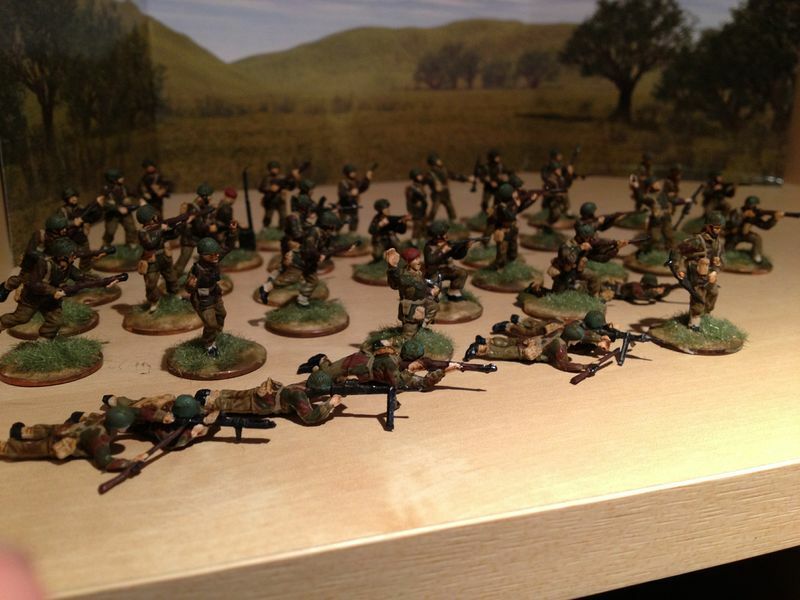 The men are from the ESCI/Italeri, Revell, and Waterloo Sets. Hello Again Friends! I’ve been away for a little while as I have been preparing to propose to my Lovely Girlfriend Lauren as well as graduation from my Masters program. The proposal was a major success and I am excited for our plans to come. Enough of all that as this is a hobby blog. As I am now on a strict (self-imposed) budget for models/supplies etc. I usually order my allotment once a month. 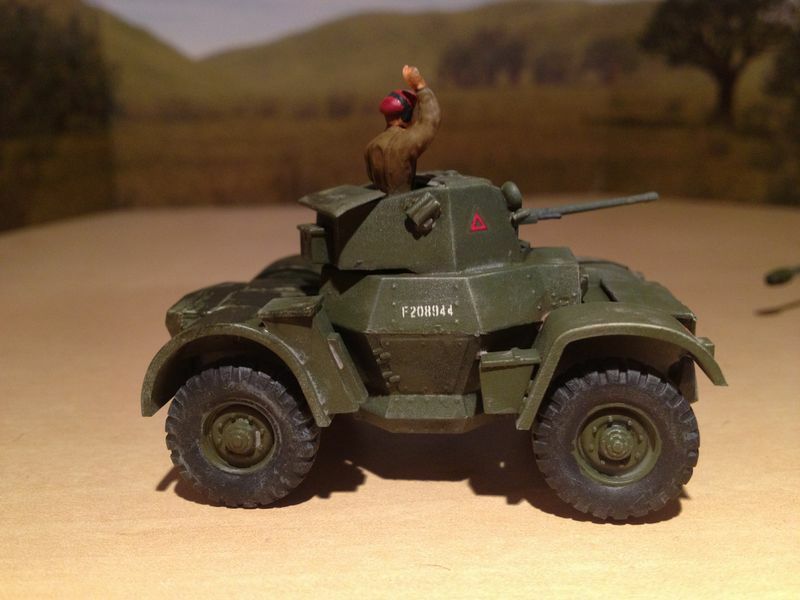 This time I ordered the British Airborne troops with Pack Howitzers and also an Italeri M20 scout car, a Daimler MK II from Hasegawa (to beef up the recce dept of my allied forces), and some Caesar Panzer Grenadiers kit#2 and Armourfast German MGs. As I was ecstatic to find my package that fateful saturday morning, I swiftly prepared the new acquisitions to be primed, and set them to the side to get their Krylon spray finish. As I live in a studio apartment with Lauren I opted to wait until we were heading out for an evening of drinks with our two friends. 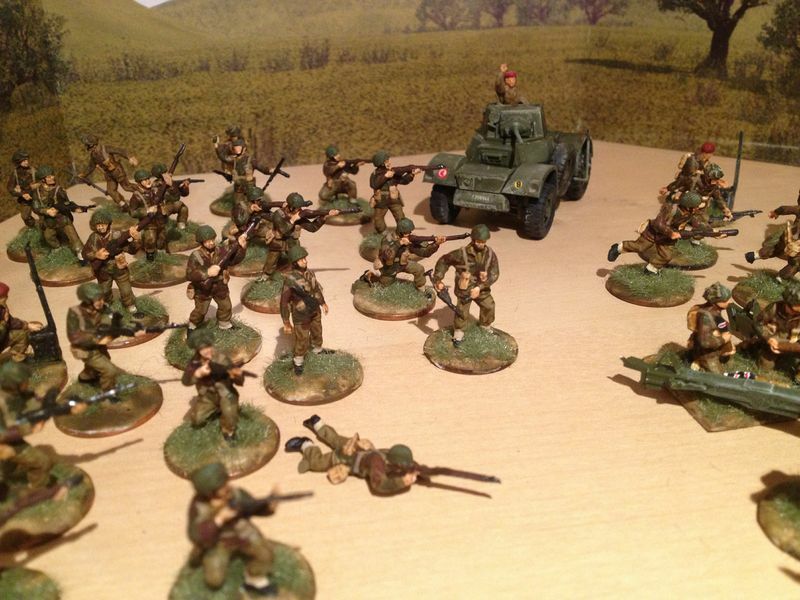 I sprayed these troops and the daimler, and left for 3-4 hours and several cocktails. Upon heading home (with a significant buzz) I became cognizant that the fumes may still effect my beloved lady. When we entered the house the paint smell was considerable and against my best judgement I decided to spare her of the fumes and set the cardboard spray-tray on the ledge/balcony/fire-escape. I in my not so sober state opened the widow and proceeded to shove my new treasures out the window, missing the ledge and falling through the grated balcony. The whole tray swiftly fell two stories down into a deserted and dark courtyard, which I had never been down to. 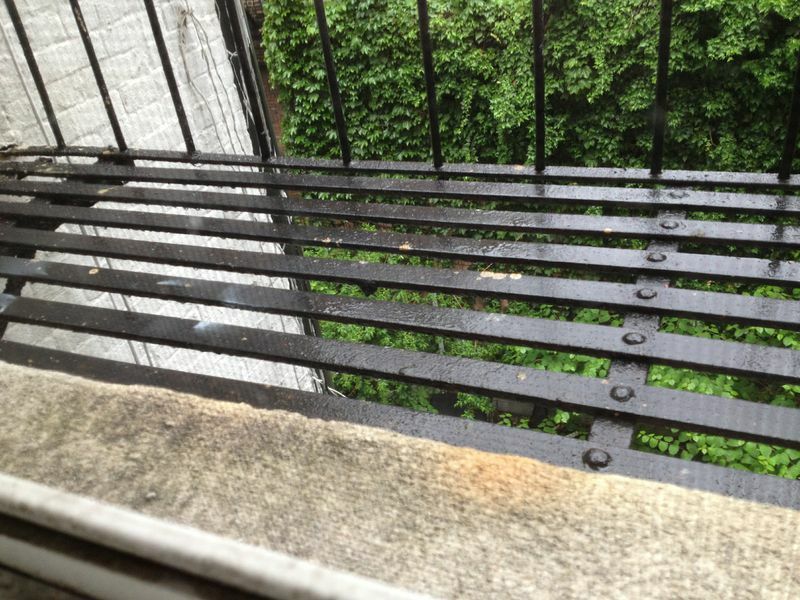 I quickly and nimbly headed out into the rainy night to try to recover the soldiers on my fire escape. Armed with a flashlight and stupid bravery I climbed out my window and found the tray one flight down with about half the men still attached. I was still distraught that I lost about 20 men and my new daimler, and went to sleep dreaming of the lost souls. 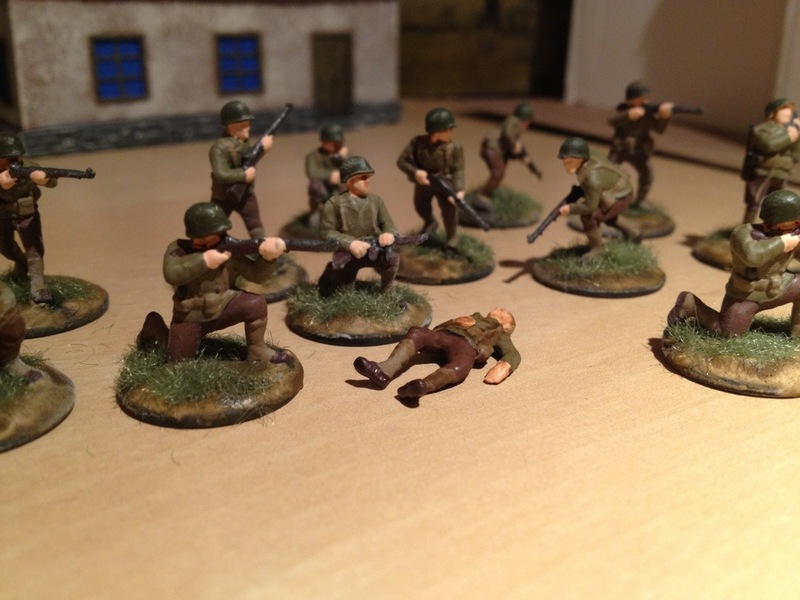 The next morning I awoke with a shudder to remember the men who were left behind. Lauren helped get ahold of my nerves as curses streamed out of my mouth at the utter stupidity of the whole situation. How could I have put them outside on such a precarious ledge so cavalierly and why hadn’t I tried to save the remaining men. She counseled/consoled me and we decided to try to break into the courtyard to recover the remaining platoon. I headed down with an exact number still missing, bust through the boiler room into a rainy dirty courtyard with my flashlight. 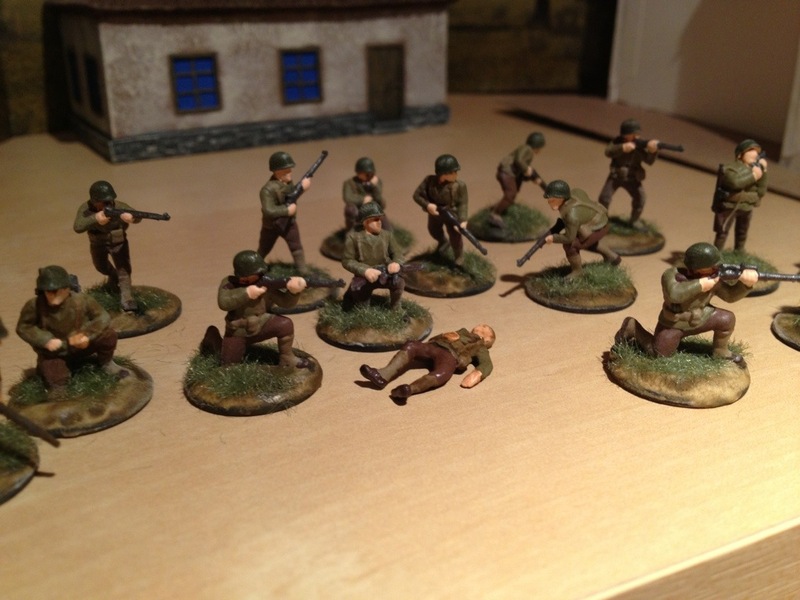 I was able to recover 19/20 of the men, and a beat up but serviceable Daimler car. That one man down will always be a casualty of that fateful evening, and it is his honor that we owe this blog. 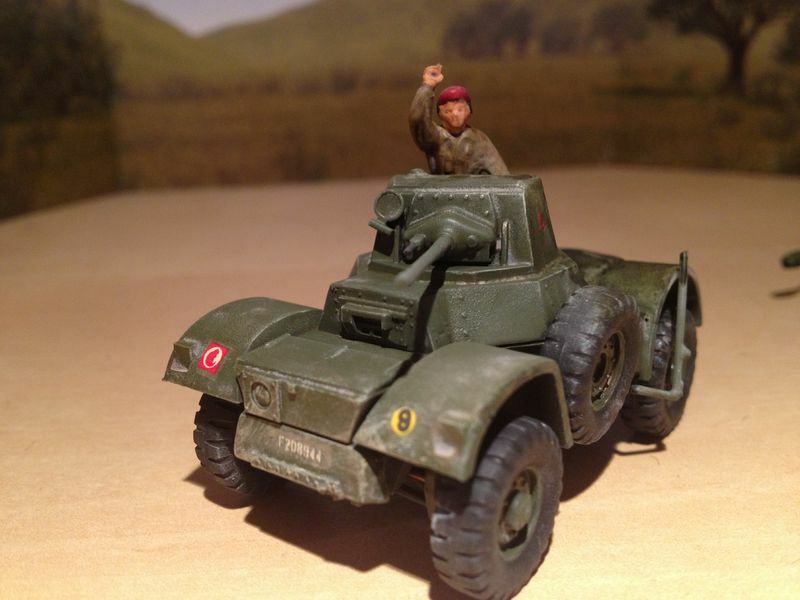 He was a strong and brave chap, a member of Her Majesty’s 6th Airborne, eternally in a seated pose. We shall miss that bloke, as his comrades go on to fight the Germans evermore on the tables of Normandy, and the Bridges across the Rhine. We will never forget him. 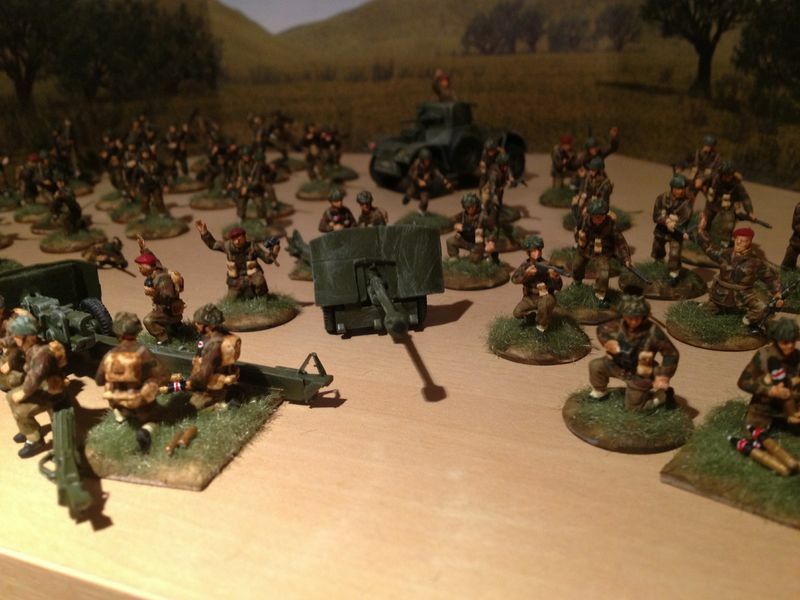 After searching high and low for a reasonable option to supply my battlegroup with 17pdrs, I found there aren’t many options in 20mm let alone plastic. 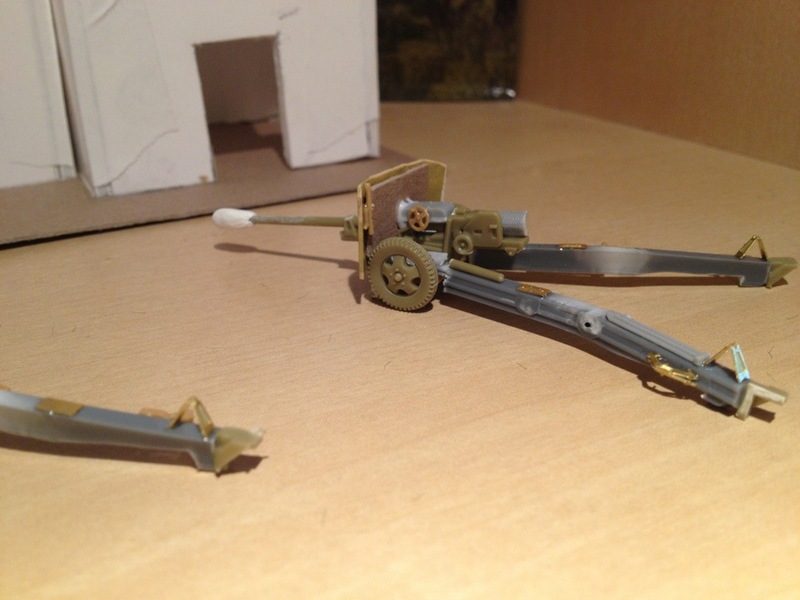 I could order metal sets with corresponding crew from one of the reputable manufacturers for a pretty price, or I could salvage some PSC barrel extras from the soviet Zis2/3 set. 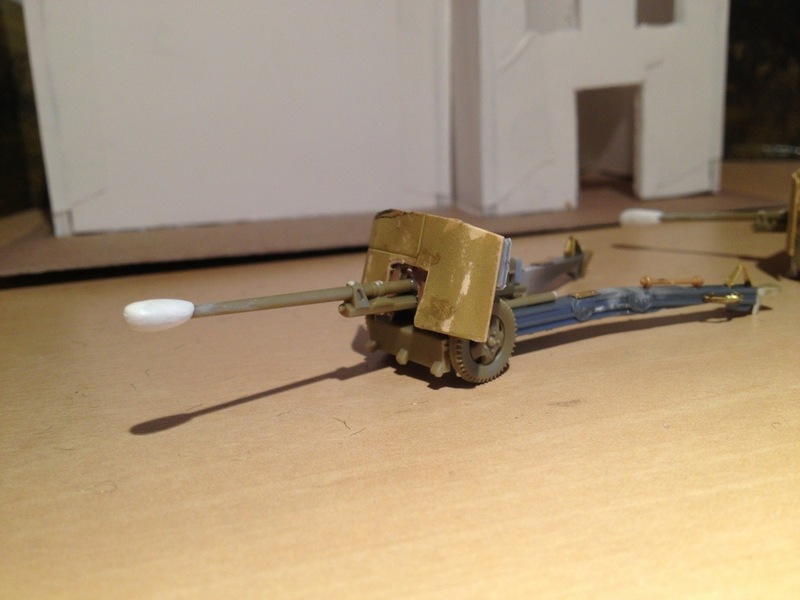 I used the long barreled Zis2 which is 57mm (a little smaller gauged than the 17pdrs 76mm) and carved it down a bit to look more the part. 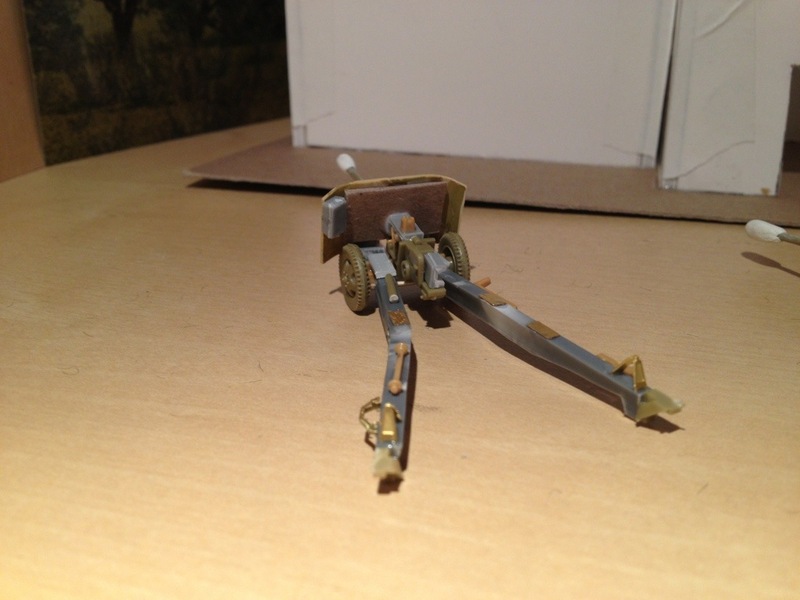 I used various pieces to create the wheelbase and gun shield from my spare parts box. I used spare shurzen from armorfast for the shields and sprue for the arms. I also found some photo etched pieces to recreate some details to give them a little flair. 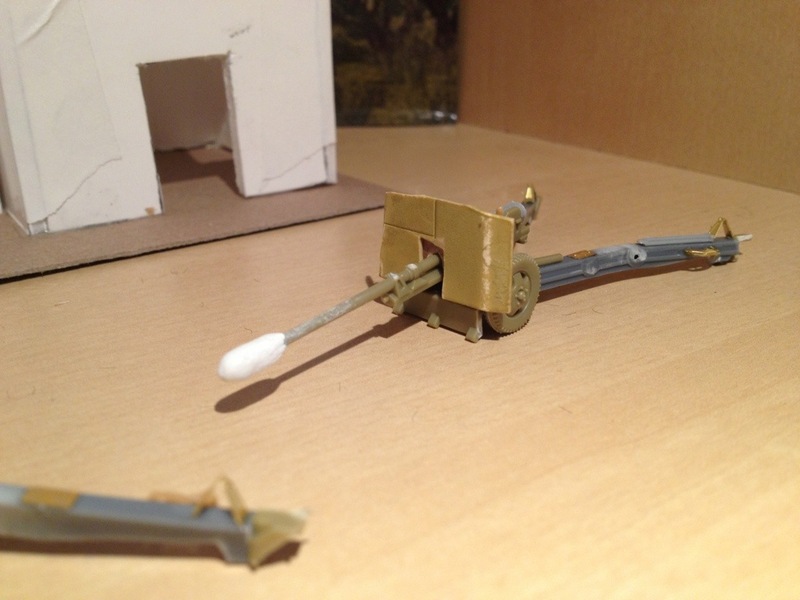 To reproduce the small ball shaped muzzle break I sculpted some miliput at the tip of the barrel. I will sand/file to shape it more once it cures. 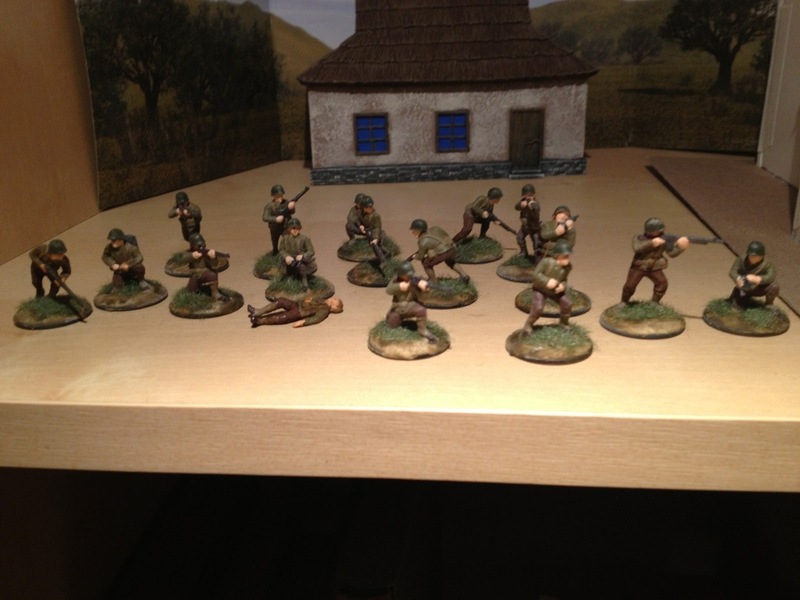 Here are the finished US soldiers I received with BGO. I like the hard plastic as it is easy to paint. 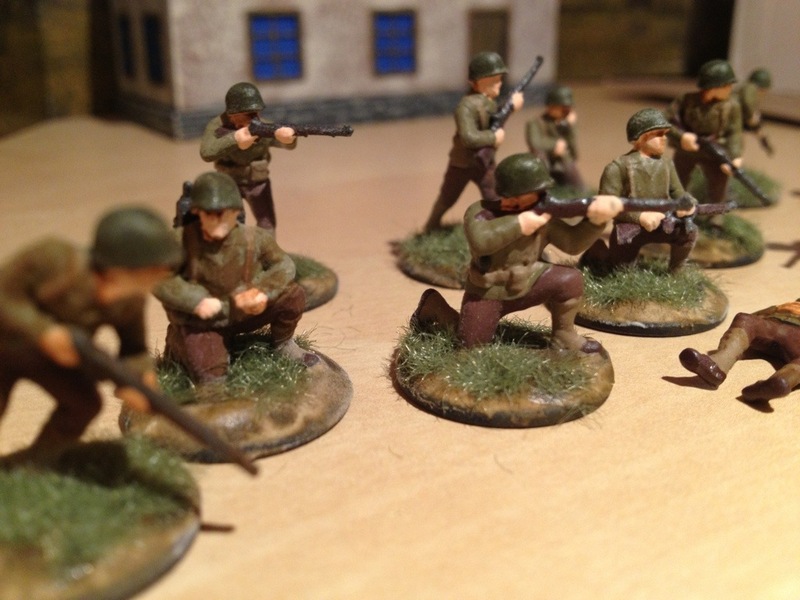 The figures are less detailed as some other manufacturers, but are serviceable game pieces and I have plans to purchase some Brits, Germans and when the heavy weapons set is released for the US I will get that too! 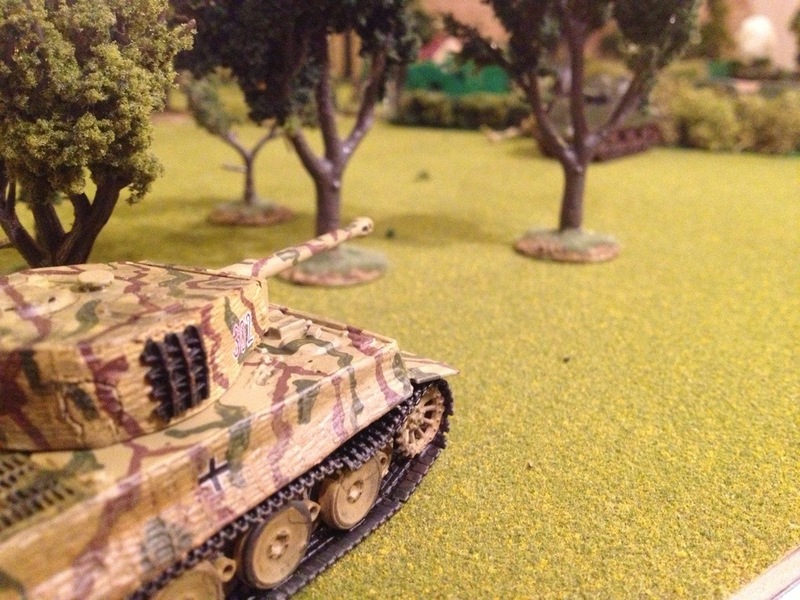 Here are the only shots I managed at the end of my first Battlegroup Overlord game. I guess we were a little too enthralled to capture more photos. 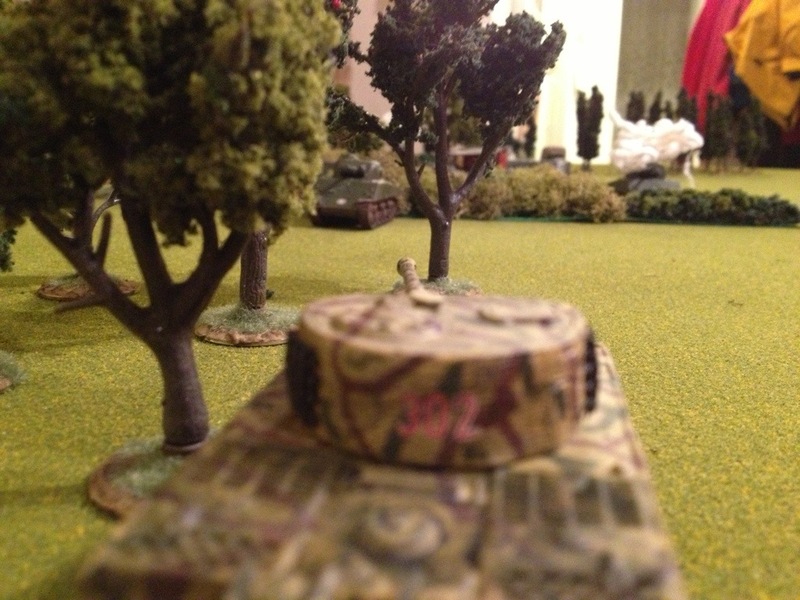 A tiger peaks out of the woods an destroys a helpless Sherman.